If you’d asked me a year ago whether I wanted calf sleeves, I’d probably have given you more than a little side-eye. It wasn’t until my triathlete dh started showing off his calf sleeves that I learned of their value for workouts. Prior to that, my sole exposure to these was knowing them as “compression stockings” (or similarly named items), worn by patients with lymph edema on their lower extremities. I took my calf compression sleeves out for two different workouts–a 5K walk inside on the treadmill at the gym and just under 5K outside on a cold Sunday morning. They were also washed in between the workouts. Both workouts went well enough. In the gym-based workout, I wore them with the same climbing capris that I used for last year’s marathon walk, and I was able to keep a nice clip going on the treadmill without my shins kicking up any measure of fuss about my speed. I didn’t overheat, and the sleeves stayed put without feeling like I was having my blood supply cut off. 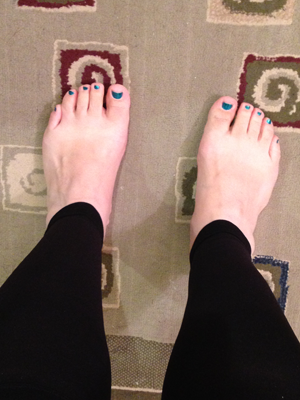 For my outdoor walk, in 30-35ºF, I put them on under thinly-lined track pants, since the temperature at the end of a walk typically feels about 10ºF warmer than the actual air temperature. My thighs were slightly chilly as I set out, but this wasn’t the case at all for my calves–they were a perfect temperature and, again, very comfortable without any concern of feeling too constricted. Unable to find any information on proper washing instructions, I hand-washed them on a day in between the two workouts. They felt exactly the same after air-drying as they did when they first arrived (no pilling, no snagging, and no easily detectable degradation of elastic quality). The Light Step Calf Compression Sleeves look and fit much like a footless women’s knee-high stocking, in tights-level weight, and I found them generally comfortable to wear before, during, and post-workout. The trouble is, without knowing that I was wearing the right size (thanks to the screwball size chart), and not knowing that I was applying them properly (due to the lack of ribbing, markings, or any other indication that definitively shows which way should face front), it’s hard for me to know that I was using them properly. That’s more than a little bit disconcerting. The price point is considerably lower than that of most calf compression sleeves ($19.99 versus the $50.00 or so that I’m used to seeing), but other manufacturers’ sleeves–including the ones dh and his fellow triathletes purchase–have packaging, ribbing, markings, and various other indications designed to increase the likelihood of correct use. The Light Step sleeves are also marketed for general use, from fitness to therapeutic needs, which suggests they’re designed for no specific application. It’s hard for me to recommend the Light Step Calf Compression Sleeves; it’s unclear to me that they did much to help my performance and they seem designed as a generic alternative calf sleeve. Perhaps a future revision of the product and packaging will move the Light Step Calf Compression Sleeves forward, but for now they leave me with the impression that these sleeves aren’t yet ready to go the distance. 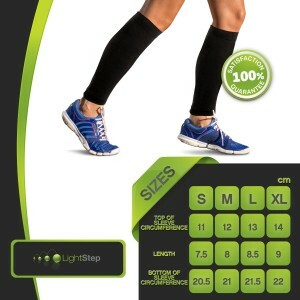 Light Step Calf Compression Sleeves are exclusively sold through Amazon.com . As Light Step does not yet appear to have a formal website of their own, you can connect directly with Light Step through their Facebook page. 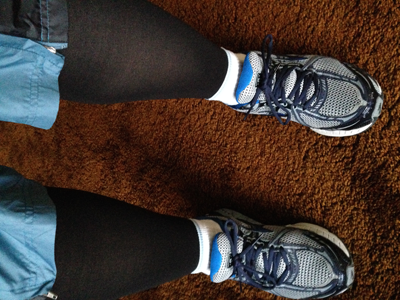 This entry was posted in product reviews and tagged calf compression sleeves, light step, product review by crunchymetromom. Bookmark the permalink.